Built in the early 1800's as a log cabin, The Home Place has been owned by Priscilla Rogers' family since then. Many generations have left their mark on the home by renovating it to meet their needs. Today it is a cozy yet spacious home in a private, rural setting on Cherokee Lake in Mooresburg,TN. Luxury log home in the mountains with Cherokee National Forest surrounding us. Over 140 acres of trails, nature and a feeling of "home" when you enter the Inn. Enjoy our "Pampering Perfected" service and our home made chocolate chip cookies from the bottomless cookie jar. Can you empty it? 10 minutes from downtown Chattanooga and a Mountain top away. Our family owned and operated Inn is conveniently located directly across the street from the famous Rock City Gardens where visitors can see seven states. We are also 5 minutes from Ruby Falls, Incline Railway and Point Park. Your private hideaway in the mountains is right here! Come alone or book for the family and friends. Absolutely beautiful views near and far with golf, swimming, hiking, even David Crockett's birthplace and President Andrew Johnson's home and much more nearby. Where the mountains meet the moon in Northeast Tennessee. Luxury inn with large, private, comfortable rooms, great views, whirlpool tubs, fireplaces, history (c.1889). Near Boone, NC--the western slope Appalachians. 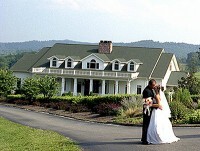 Elopements, destination weddings and A Cottage in the Woods for families/kids/dogs. Elegant Waterside Inn located on Watts Barr Lake.